Sudden cardiac death is believed to be involved in nearly a quarter of all human deaths, with ventricular fibrillation being its most common mechanism.1 One of the first descriptions of ventricular fibrillation and its link to sudden cardiac death belongs to the British physiologist John A. McWilliam, a former student of the famous Carl Ludwig, who was working at the University of Aberdeen. He wrote in the late 1880s2 that ventricular fibrillation wreaks chaos across the fibers of the heart, trapping the organ in a helpless quiver and depriving the body of oxygen, bringing about death within a matter of minutes. The story of how modern medicine and technology came together first to understand, and then to defeat fibrillation, is enlightening on many levels. It begins with astounding cures that seem to predate the discovery of the phenomenon itself; dives into the gothic with grisly experiments on executed criminals; rises into the light as the understanding of both electricity and cardiac pathophysiology increases; and flows vigorously into the modern blossoming of cardiopulmonary medicine and intensive care. It involves lessons transmitted across academic generations and geopolitical divisions, and discoveries made possible by cooperation of fields as dissimilar as surgery and electrical engineering. However, it also abounds with examples of great gaps of understanding, lengthy detours, and misdirected research; many key discoveries were preceded by periods of stagnation, while others were in fact set aside and had to be rediscovered altogether many decades later. However, as this chapter shows, the delays were seldom arbitrary and the detours seldom fruitless. It was the result of efforts by many devoted experts, many of them working in parallel or in competition, that led to the creation of defibrillation as we know it today. 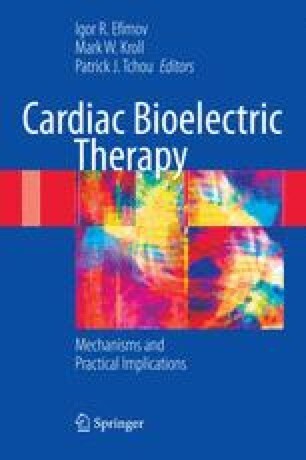 The case of the divergent investigations of alternating- versus direct-current electric shock therapy is particularly illustrative.